Amazing artworks by Shohei Otomo. His interview video to understand his thoughts behind his art. Backwoods Artist Profile : SHOHEI OTOMO from Alexander Mitchell on Vimeo. His father is Katsuhiro Otomo, famous for creating Akira. I'm a big fan of Katsuhiro Otomo too. 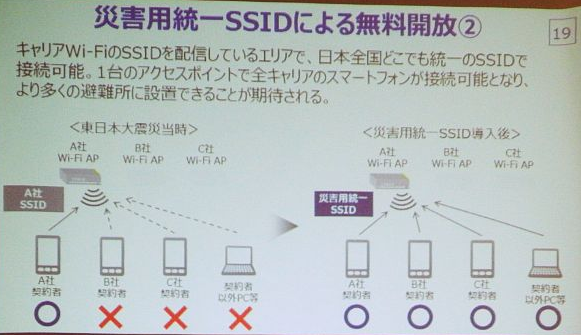 Great news: When large-scale natural disaster happens in Japan, within 72 hours, unified SSID "00000JAPAN" will be launched, and regardless of which carrier you are using, and regardless of where you are in Japan, you can use this Wireless Internet for free. Japan learned from the natural disaster back in March 2011. During natural disaster, many of the telephone and mobile phone carriers becomes unusable. It is impossible to predict which carrier will be down, and where. Also, in many of the cases the Internet was a useful network to communicate, with examples such as people getting their lives saved by communicating via Twitter. In September 2013, experiments were conducted in Kamaishi and Sendai, in order to publish a guideline on opening public wireless LAN during natural disasters. In March 2011, there were only 13,000 public wifi access points in Japan, in 3 years it increased 70x and as of March 2014, there are 900,000 access points, combining those of NTT East & West, NTT Docomo, KDDI and Softbank. Also, they are planning to prepare more public wireless LAN infrastructure leading up to Tokyo Olympics in 2020. This unified SSID is planned to launch next Spring. Also, a disaster portal will be launched with useful information for evacuation and rescue, and it will include search engines (Yahoo and Google) and links to major social networks (Facebook, Twitter, mixi). 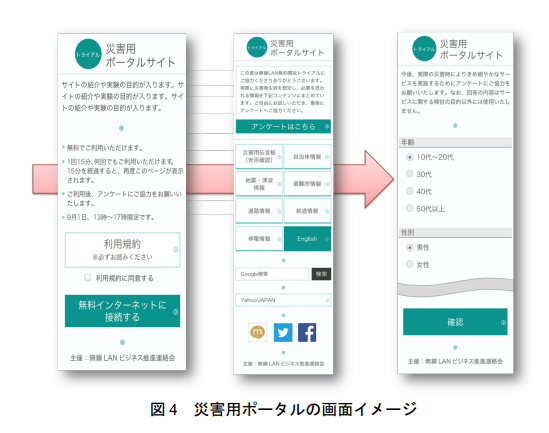 Related: NTT-BP launched Android/iPhone apps called "Japan Connected-free wifi" which enables users to connect easily to public wifi networks at airports, rail stations, and municipalities all over Japan. Finding public wifi was the biggest complaint travelers had in Japan, and this app was created to tackle this problem.